RELY-RB Time-aware Redbox Switch combines HSR/PRP redundant Ethernet links with regular Ethernet ones in a single equipment. This approach solves the need of switching PTP traffic and providing access to high-availability topologies to the regular Ethernet nodes or LANs. RELY-REC Time-aware Network Recorder includes means for continuous network monitoring and further debugging. This equipment integrates advanced technologies to support combined PTP and HSR/PRP GbE topologies. 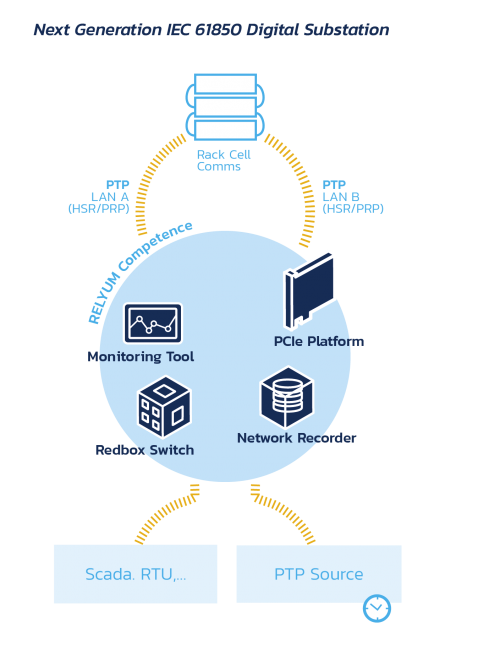 RELY-PCIe Time-aware Redbox-DAN-Switch PCIe Platform allows direct access to time-aware high-availability networks to legacy PC systems (PCIe or PCI). Moreover, this board removes the need for additional Redbox equipment to connect other non-redundant nodes (Single Attached Nodes – SANs) thanks to the third port which implements low-latency switching to the redundant ones.